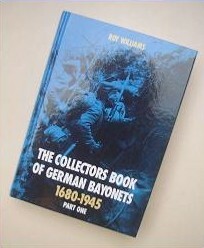 For many years collectors of German bayonets have had to buy bayonet reference books from a variety of sources, each with a different way of listing individual specimens or groups, and often contained within larger volumes that show bayonets from all over the world. 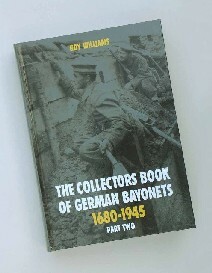 This two part publication privately published by the author, is an attempt to give both new and established collectors a comprehensive guide that clearly identifies the rare and unusual from the more common bayonets. Starting at the earliest date and keeping original, modified and later types in family groups. 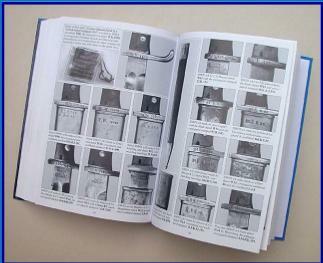 Each full length bayonet photograph has been numbered in sequence, with a brief description of the model type and scabbard, plus details of the manufacturers trademarks, regimental markings & dimensions. I have also added some interesting troop photographs and where possible shown bayonets fixed to the rifle. The first part contains hundreds of detailed photographs of many interesting & unrecorded specimens from collections throughout the world. Limited Edition of 620 copies, A5 size, with hardback colour cover and 552 interior pages printed in black & white, with over 2000 photographs. Containing examples from the German States before 1870, Prussian, Bavarian, Saxon and Württemberg sword and knife bayonet types, bayonets from 1870-1900 with the makers and regimental markings photographed, rare trials and experimental types and bayonets used during World War I including the 98/05 makers.